The 1000 Main building may sell for a record-high price. HOUSTON – LaSalle Investment has agreed to pay $450 million for the 1000 Main building in downtown Houston – a price that will be the highest ever paid in Houston, according to the Real Estate Alert newsletter. LaSalle’s price of $537 per square foot will surpass Houston’s existing price record of $524 per square foot, the newsletter said. Other buyers in the trophy hunt included Metzler Real Estate of Seattle, Heitman, J.P. Morgan, and KBS Realty. Foreign buyers, including players from Europe, the Far East, the Middle East and Canada also submitted offers to purchase the 36-story building. Hines, in partnership with a Korean investor, reportedly was a serious contender also. Bernard Branca, senior vice president in CBRE’s Houston office, is marketing the 837,000-square-foot building, which was formerly known as Reliant Energy Plaza. 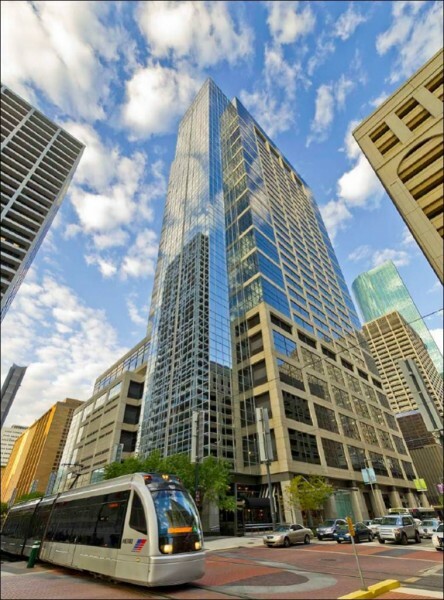 Houston’s existing all-time record per square-foot price is the sale of the Hess Tower, which is located in downtown Houston near Discovery Green park. The H&R REIT bought the Hess Tower in 2011 for $442.5 million or $524 per square foot – the high-water mark on a per square-foot basis. The inventory of big trophy Houston buildings for sale has been tight because so many deals have happened in the recent years. Houston is considered a highly desirable investment market. A survey by the Urban Land Institute ranked Houston as the No. 1 market in the nation for realty investment and the city has added 120,000 jobs over the last 12 months. So investment buyers – foreign and domestic – have been scouring Houston for opportunities, expanding from their myopic focus on the East and West coasts. In recent weeks some have been concerned about the Houston market, however, because oil prices have fallen from over $100 a barrel in June to less than $70 a barrel today, for West Texas Intermediate, the American benchmark. The 1000 Main building, owned by an Invesco Real Estate partnership, is more than 99 percent leased with Shell Oil occupying 332,000 square feet. Rental rates have risen in Houston’s Class A properties in recent years and some buildings are asking $50 per square foot rents. The 1000 Main building was developed by Richard Everett of Century Development and opened in 2003. The Invesco purchased the building in 2012 for $355 million. The building is located on the Main Street Square METRO stop on a block bordered by Main, McKinney, Travis and Lamar. A few blocks from the 1000 Main building, Hines is building 609 Main at Texas – a 48-story spec tower that is expected to be rated Class AA+ when it opens in 2016.